day 336. 6 june 2008 - a journey to another world. it's been 11 months to the day since i departed nyc, and have been told a friend has departed to another world. last night, shortly before midnight, ellen rafel became an eternal angel. 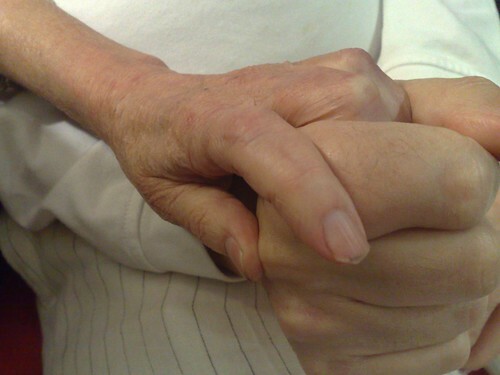 in the photo above, her hand is to the left and erwin's, her husband, is on the right. this past month's journey has been intense and an emotional roller coaster. up and down and around my heart has swung. while the month of may started in a fog of romance and trudged up to the peak of heartbreak, down into the valleys of birthdays, and onto a few loops de loops of two new jobs. now, i can see the tracks race off into the distance. now separated only by physical space, the memory of erwin and ellen and the care they demonstrated for their sons, themselves and all their friends and family has left an indelible mark on my soul. the passion she demonstrated was recognized when over 100 people jammed themselves into a tiny two bedroom penthouse apartment on the upper-west side to celebrate her last birthday. as we sang and embraced her life, i knew ellen's glorious soul wouldn't be around too much longer. as we said our goodbyes, it became apparent to me that this family had impacted me more than most. with lessons from own family, erwin's tenacity as a refuge and ellen's love as a social worker, i set forth to see the beauty of all we can touch. along this journey i have found something that is indescribable. something i can never articulate in words, photos nor movies. on six continents, i found this thing buried in every person who open their mouths, families, and hearts... never could i have imagined that the world is filled with so many loving people. while i haven't been diligaent in writing about the lessions i've learned, since my return i have lived every moment knowing that my passion to make this a better planet is unexcable. the love we can share with each other is something that should never be taken for granted. the opportunities we have to change everything around us is real. sunday, when i stand with her family and countless other souls who have been touched by her love, i know she will be with us as an eternal lesson that peace and hope are the only two things we need. you don't need to be famous, you don't need to be anyone of any material goods - just love everyone - love the unescapable and work to make it better. well all else fails, be at peace. ellen, thank you for being one of my teachers.